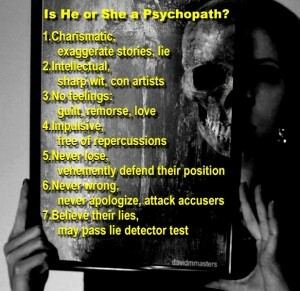 It is not uncommon to encounter a sociopath or psychopath at some point in one’s life. In the beginning, it may be one of the greatest experiences in your life, but as time goes on, it will likely be the worst experience in your life. They come in both genders, though most are male. They have been referred to as emotional vampires, sucking the life (emotional and financial resources) out of those that they have influence over. 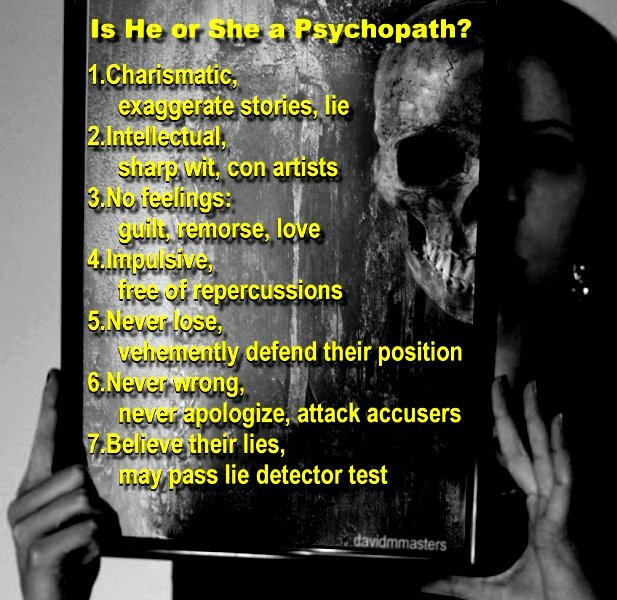 Sociopath is the new, more politically correct label for a psychopath, so henceforth when I refer to a “sociopath” know that it is interchangeable with psychopath (psychopath is the old-school reference that I believe is a more accurate label of the condition). Sociopaths are charismatic and are able to attract supporters easily. They are wonderful speakers who are able to engage their audience who can easily engage the emotions and attention of those fortunate enough to be in their presence. They exaggerate stories skewing the truth for their self-serving benefit, and will go as far as to lie and place themselves in someone else’s story and claiming it is their own. Sociopaths are intellectual. They have a gift of having incredibly sharp wit and intelligence enabling them to masquerade as highly-educated, bob and weave in live situations. This also makes them excellent con artists able to conceive, plan and execute elaborate schemes, while (mostly) staying one step ahead of the authorities. Sociopaths are devoid of feelings. They do not grieve, are in capable of feeling guilt, shame or remorse, empowering them to easily victimize anyone. They will enthusiastically engage in anything that bolsters their position at someone else’s expense. They do not love. They are incapable of giving or receiving love, but terribly acute at acting as though they are in the throes of love, if it will help them achieve a desired result. They are great actors/performers with no real feelings whatsoever. Sociopaths are impulsive, often acting or speaking without thinking through potential consequences of their words or actions, and are more likely to take risks, being free of repercussion, since they see themselves as above the law or the constraints of the social norm. Sociopaths never lose. They will dominate anyone who gets in their way, will vehemently defend their position, often by telling lies and spinning wild tales in an effort to discredit naysayers. Sociopaths are never wrong. They never apologize; do not feel remorse for hurting others and are incapable of feeling guilt. If asked to apologize, will often strike out and attack their victim, rather than admit they may have made a mistake or misstep. Sociopaths believe their own press. Once they have said something, it becomes gospel in their mind; so much so, that they can often believe their own bold-faced lies, even to the point of being able to pass a lie detector test. They keep a long list of secrets, and are not forthcoming about intimate details of their past, unless they are fictitious. So, what do you do if you discover you’re in the presence of a sociopath? Simply put as much distance between yourself and them as soon and as safely as possible. Curtail any continued communication with them immediately if not sooner. Be aware that if they have not bled you dry, or achieved their goal in manipulating you; they will do anything in their power to repair their relationship with you, so that they can complete their exploitation of you. Don’t let them do it. Surround yourself with friends who will help shelter you from further exposure. Thanks to Damon Marturion for this post.